It’s the most wonderful time of the year! November and December are upon us with Thanksgiving approaching quickly and Christmas and New Year’s soon to follow. Festivities will ensue, filled with gifts, decorations and food for all to indulge in. Like all things, however, the holidays must come to an end and with the completion of every Christmas party, Thanksgiving celebration and New Year’s Eve bash, comes heaps of garbage and waste. In fact, 25% more waste is created between the months of November and December than at any other time of the year. 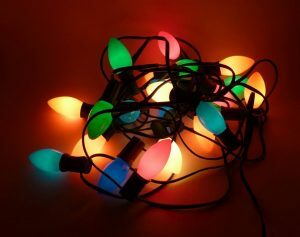 Christmas Lights Done Right – Light up your office this year will LED Christmas lights instead of traditional ones. LED’s use less energy and have a longer life, while offering the same amount of shine for your business at Christmas time. Your energy bill, which is already on the incline due to heating costs, will thank you! Old lights not working? You can recycle your defective lights here, at our Nitro facility! Say ‘Happy Holidays’ Digitally – Over 2 billion holiday cards are sold throughout the United States every year. Many cards end up in the landfill. Save costs by sending your clients, patrons and prospects an e-card expressing your holiday greetings and wishes. Nowadays you can upload handwritten signatures and personal messages, making e-cards just as special as the paper ones. Give the Gift of Experience – Give your employees or co-workers the gift of adventure or a day of fun! That concert your business partner has been talking about for months? Or maybe a spa day for your receptionist? Wrapping paper and packaging add up quick, so keep the waste to a minimum and your office team’s happiness to the maximum with fun experiences. O’ Christmas Tree – Make sure your live Christmas tree isn’t kicked to the curb after the holidays only to end up in the landfill. In most cases, communities have a tree collection plan in place which allows trees to be mulched and used in other ways. Charleston area: The West Department of Environmental Protection and West Virginia Division of Natural Resources host a Christmas tree recycling event annually at the Capitol Market in downtown Charleston. Look for details on this year’s event mid-December. Huntington area: The City of Huntington’s Sanitation and Trash Division secures locations where city residents can drop off their Christmas trees for free disposal. Look for details on this year’s drop off locations and dates to be posted at www.cityofhuntington.com. Remember to start small when implementing new, sustainable practices to your business. Plan to use only what you need – food and party supplies tend to be big culprits in the waste department, with almost 40% of food wasted. Have containers labeled clearly for your recyclables to make the process easy for everyone. WV Cashin has recycling facilities for you to utilize. For your paper and cardboard material, we offer easily accessible separators that we accept for donation in support of our scholarship programs. Make use of WV Cashin when your holiday celebrations come around while planning to take steps towards a more sustainable holiday season for you and your business!